WINNIPEG – 2015 finished on a strong note. Following on the heels of a record sales month for November, December sales of 642 were up 4% from last December. They are the third highest for this month, and are only behind the best sales years ever by a very modest amount. While sales and even prices have shown consistent and similar results, listings have not chartered the same path. The number of listings entered on the MLS® were 24,603 in 2015, up 7% over 2014, and 41% over the 10-year average of 17,433. With an increase in listings but sales remaining consistent, the market’s inventory has also been rising month to month. This is borne out in having over 5 months of inventory available going into 2016. An indicator of stiffer competition for selling your home is evident when you see the number of single family home sales selling below list price. Properties below list accounted for 65% in 2014 but now represent 75% of the market in 2015. In December alone 87% of all single family home sales sold below list price. Of the single family or residential-detached listings which sold in 2015, on average they achieved 98% of the total list price. When 2015 was all said and done a new MLS® dollar volume record was established at $3.5 billion. This resulted in a 2% increase over 2014. Despite sales being higher this December from December 2014, dollar volume actually fell 2.89% when compared to December 2014. It was a tale of different stories when it came to the two primary MLS® property types. Residential-detached performed exceedingly well with sales and dollar volume up 3 and 5% respectively in comparison to 2014. On the other hand, condominiums never recovered from an unexpectedly poor first quarter where sales were off by 20%. By year end this deficit was cut in half but nonetheless represented a 10% decrease compared to 2014. The average sales price for residential-detached was $293, 992, a 2% increase over 2014. The average condominium sales price showed a 1% decrease from $239,171 in 2014 to $236,204 this year. 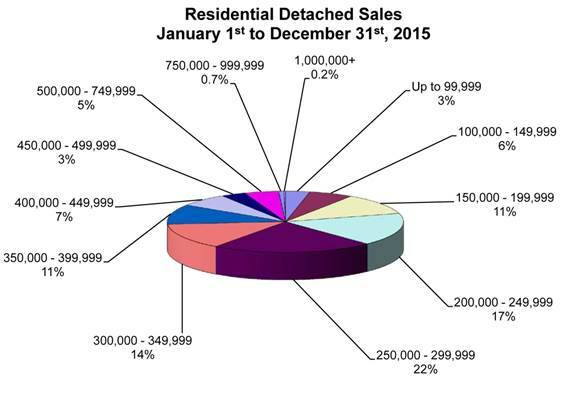 Residential-detached represented nearly 3 out of every 4 properties which sold on MLS® in 2015. Condominium market share was 12.5%. 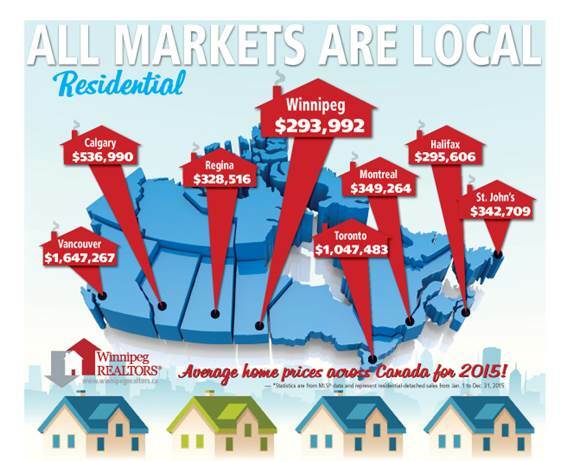 25% of residential-detached sales in 2015 happened outside Winnipeg in the capital region. The southwest quadrant of Winnipeg was second with 19% of total sales. The most active price range for residential-detached sales in 2015 was $250,000-$299,999 (22% of total sales), followed by the $200,000-$249,999 (17%) and the $300,000-$349,999 (14%). Average days on the market for residential-detached sales was 33 days, 3 days slower than 2014. The highest-priced residential-detached sale was $2.7 million. The least expensive sale was $8,000. The most active price range for condominiums in 2015 was $150,000-$199,999 (30% of total sales), followed by the $200,000-$249,999 (20%) and the $250,000-$299,999 (18%). Average days on market for condominium sales was 49 days, 9 days off the pace set in 2014. The highest-priced condominium sale was $950,000. The least expensive sale was $57,000. Looking ahead to 2016, Manitoba’s GDP is expected to increase to 2.3% which is an improvement over the expected increase of 2.0% in 2015. In keeping with one of the country’s best GDP’s, Manitoba’s employment is forecast to grow by 1.6% in 2015 and 1% in 2016. This will keep its unemployment rate below 6%. Manitoba had Canada’s second highest population increase of 1% in 2015.